Interesting info about this graphic being the international symbol for tsunamis and image of the corresponding japanese graphic that gave rise to it. 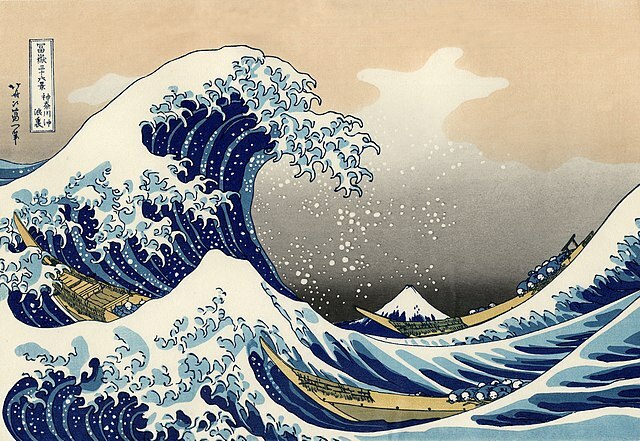 In fact, it is 'The Great Wave' desktop wallpaper on Mac OS X. This unicode pictograph is a thresholded, cropped, and recolored version of a famous japanese print, 'The Great Wave off Kanagawa' (神奈川沖波裏). It is from 36 Views of Mount Fuji, Color woodblock print by Hokusai. "living only for the moment, savouring the moon, the snow, the cherries in flower and the leaves of the maple, singing songs, drinking sake and enjoying simply floating, indifferent to the prospect of impending poverty, optimistic and carefree, like a pumpkin dragged along by the current of the river."